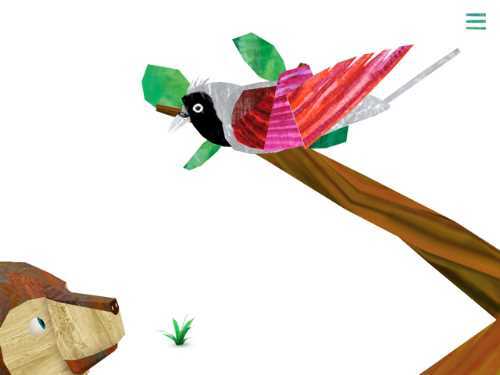 A fantastic first app for toddlers and preschoolers that brings alive the world of Eric Carle's Brown Bear book. The titular character of Eric Carle's classic Brown Bear, Brown Bear, What Do You See? 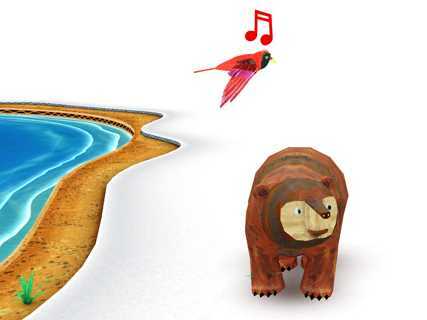 book greets kids in Eric Carle's Brown Bear Animal Parade, a gentle, early-learning app for toddlers and preschoolers. The 3D bear follows the player's finger to explore a sparsely-populated, white world filled with eight animals that need coloring. When the player taps on an outlined animal, it fills in with color that resembles the collage art found in the Brown Bear book. After each animal awakens by being colored, the creature falls into line behind Brown Bear, to join his parade. The animal makes sounds and musical notes, so that by the end, the nine animals create their own musical song. Occasionally, the animals will entertain the player with unexpected animations, such as the fish jumping into multiple ice holes and changing colors each time it dives. 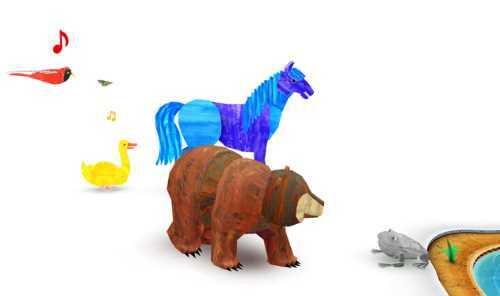 Brown Bear Animal Parade is an exploratory app, where kids are in charge. They become the Pied Piper of Brown Bear's world, wandering around to find and collect animals. The player colors each animal by touching it. And at the end, children can record their own animal sounds or singing to change the song that is played. Good starter apps for young children provide an enticing digital playground where failure isn't possible. Eric Carle's Brown Bear Animal Parade does that by making Brown Bear so appealing that kids want to watch him lumber across the screen and touch him to see him preen. It also captivates children by scattering eight other animals around this world to find. Plus, the app makes good use of technology, by easily allowing kids to contribute their own animal sounds or music. Good starter apps should also delight players so that they are curious to explore further. 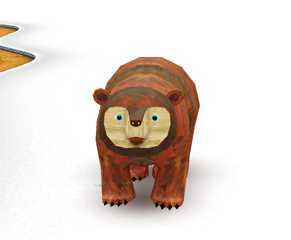 Eric Carle's Brown Bear Animal Parade delights preschoolers and toddlers by having the animals change color when touched and by hiding surprising animations around this world. For example, if your child taps a blade of grass, a butterfly or dragonfly may fly out. Also enchanting is the addition of music played by each animal when it joins the parade. Eric Carle's Brown Bear Animal Parade provides gentle learning opportunities relating to identifying animals and learning about colors. Since there are no spoken words, this is an app that is best played by a child with an encouraging adult or older sibling. 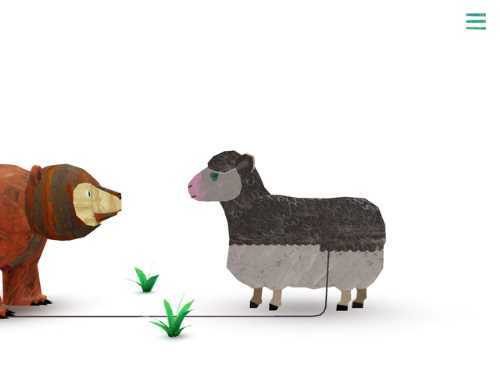 This co-play environment enables talking about colors and animals. It provides the perfect forum for asking what color is the cat or the duck? Eric Carle's Brown Bear Animal Parade is the perfect app to open after reading Eric Carle's Brown Bear, Brown Bear, What Do You See? book. But it is also a great standalone app to introduce toddlers and preschoolers to apps, colors, and musical sounds. If your children like this app, check out another Eric Carle app called My Very Hungry Caterpillar from this developer. 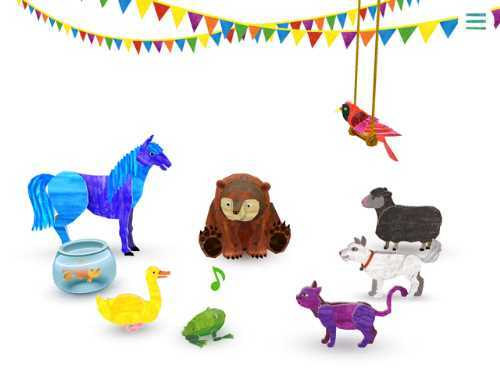 This Eric Carle's Brown Bear Animal Parade app review was written by Jinny Gudmundsen.